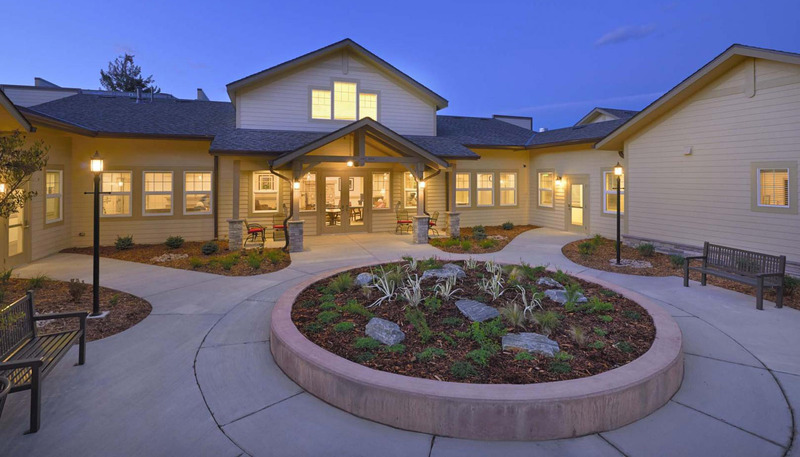 The Gardens at Columbine Memory Care project is a senior living building. The facility is locally owned and is located in Littleton Colorado. It has two levels with 100 apartments and is surrounded by beautiful gardens with an attention to privacy for its occupants. Some of its accents include walkways throughout accompanied by a large gazebo. The first floor and overall building footprint is approximately 18,500 square feet, and the basement area is approximately 5,800 square feet. The first floor contains private rooms, community spaces, an exercise room, library, lounge and dining area. The basement is mostly back-of-house with offices, a conference room, storage, laundry and maintenance. There are also two interior courtyards and an extensive outdoor area.